An elegant way to start a meal, this ridiculously good soup can be ladled into bowls and served. 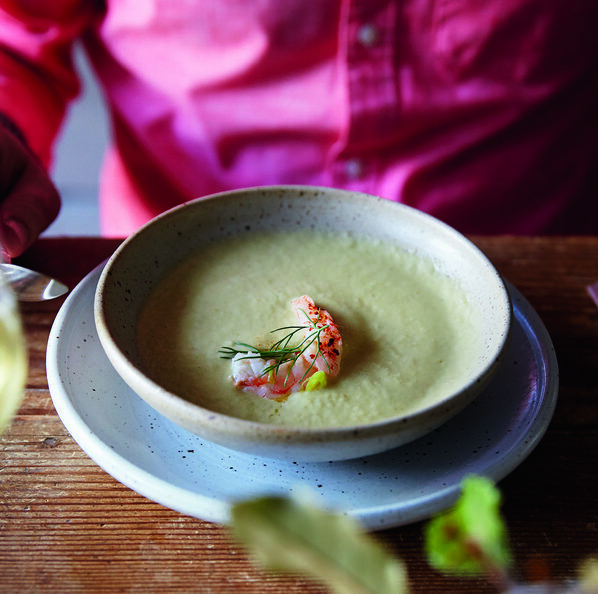 But arranging the shrimp and other garnishes in the bowl beforehand and pouring the soup at the table makes for an extra special presentation. Add grilled bread and a side salad and you’ve got an awesome meal. Peel the shrimp, reserving the shells and tails. Devein the shrimp and chill in the fridge. In a large nonreactive pot over medium-high heat, sear the shrimp shells and tails with 2 tablespoons olive oil, stirring until bright red, about 3 minutes. Add 1 cup wine, simmer for 10 minutes, then add 3 1⁄2 cups water, bring to a boil, reduce heat to low, and simmer for 45 minutes or until the liquid reduces to about 1 1⁄2 cups. Strain and reserve. In a cold, nonreactive pot, add 1⁄2 cup olive oil and the chopped garlic. Over medium heat, saute the garlic slowly, stirring constantly, until golden, about 4 minutes. Add the fennel and onion and stir, scraping the garlic off the bottom of the pot so it doesn’t burn and cook, about 5 minutes. Add remaining cup of white wine and cook until it evaporates, about 15 minutes. Add 4 cups of water and 1 tablespoon salt. Bring to a boil, then reduce to a simmer and cook for 30 minutes, or until the liquid has reduced to about 21⁄2 cups. Remove pan from heat and cool for 15 minutes. Stir in the reserved shrimp stock. Transfer to a blender in batches and blend until smooth. If needed, you can thin with water or thicken by simmering down the liquid, stirring occasionally, over medium heat. Warm a large skillet with 2 tablespoons olive oil. Add the green garlic and 1 teaspoon of water. Sweat lightly, ensuring the greens don’t begin to brown. Add the shrimp in a single layer. Season with 1 teaspoon salt. Gently cook the shrimp on each side until just pink, about 4 minutes total. Add the lemon juice and remove the pan from the heat. Reheat the soup if necessary. In 6 individual soup bowls place a dollop of yogurt and three pieces of shrimp. Sprinkle in some pepper flakes and a small fennel frond, carefully ladle in soup, and serve.